The pipework, with the exception of the largest basses, will be cleaned and repaired and case pipes also strengthened. New pipework will be scaled to match the original, and constructed of similar materials. Original wind pressures reinstated and voiced. Off-notes will be supplied with wind by conveyances of organ metal. The tonal qualities of the reed stops will be assessed and revoiced where applicable. With the organ reassembled the speech and balance of the whole organ will be reviewed and adjusted. The work of 1917 and 1931 will be regarded as the reference for this task, and our approach will be dedicated to the recreation of the aesthetic of this earlier scheme. Organ then to be retuned. The painting of the decorative pipes will be restored by Robert Woodland in the Minster during next year. The screen console will be completely rebuilt, with its design and layout being based on Harrison & Harrison practice of the era. 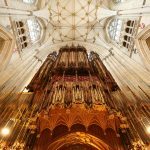 The nave console will be restored, and the new work will adopt the traditional Harrison & Harrison idiom. The keyboards will be overhauled and fitted with gold contacts. The piston layout will be retained and enhanced to match the layout agreed for the Screen console, and new contacts will be fitted. The jambs will be new, with new divisional plates. New long-draw solenoids will be installed. The drawstops will be cleaned and supplemented in matching style, and selectively re-engraved consistent with changes to the specification and in order to achieve a good match throughout. The pedalboard will be overhauled and fitted with new contacts. New foot pistons will be installed to an agreed layout matching the Screen console, with new piston sweeps and surrounding woodwork. New swell pedals of traditional Harrison & Harrison design will be installed. Remaining console woodwork will be restored and refinished, and the bench will be overhauled. The console case and platform will be repaired and refurbished. New slider soundboards will be installed throughout the organ. A number of unit chests will be retained from the present organ. These predominantly serve the largest Pedal basses, and all will be fully overhauled and restored, and their actions will be re-leathered and fitted with new magnets. New unit chests will be constructed. New 3 stage actions will be installed for all new slider soundboards and unit chests. New electric drawstop actions will be fitted to all slider soundboards. A new wind system designed on traditional lines and utilising reservoirs will be installed. With the exception of the main wind trunking from the blowers all will be new. Wind stabilising concussions will be installed to ensure a steady supply of wind. New wind-dumping tremulants will be installed. The reservoirs in the blowing chamber will be re-leathered and the control valves overhauled. The present blowers will be rebuilt and augmented. New swell boxes will be installed for the Solo and Swell organs. New coupling equipment will be installed, with a data cable link to the Nave console. There will be a multilevel capture system with 16 divisional and 999 general memory levels. New low-voltage power supplies, wiring and fusing will be installed throughout the organ. Operation of the shutter fronts will be fully electric from both consoles. A new mechanism will be installed for this. 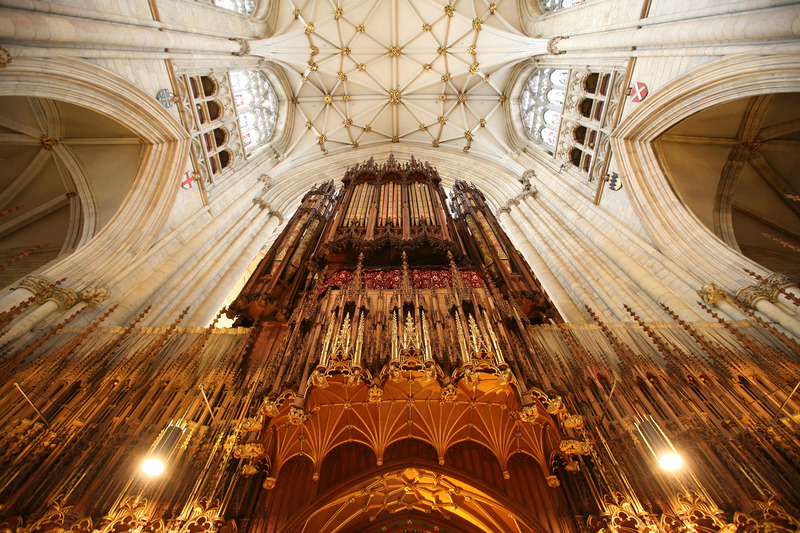 These are some photos taken by York Minster whilst on a visit to the workshop coinciding with the media visit. 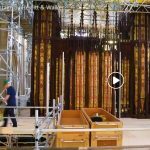 Drone footage by York Minster of the work as it goes ahead.